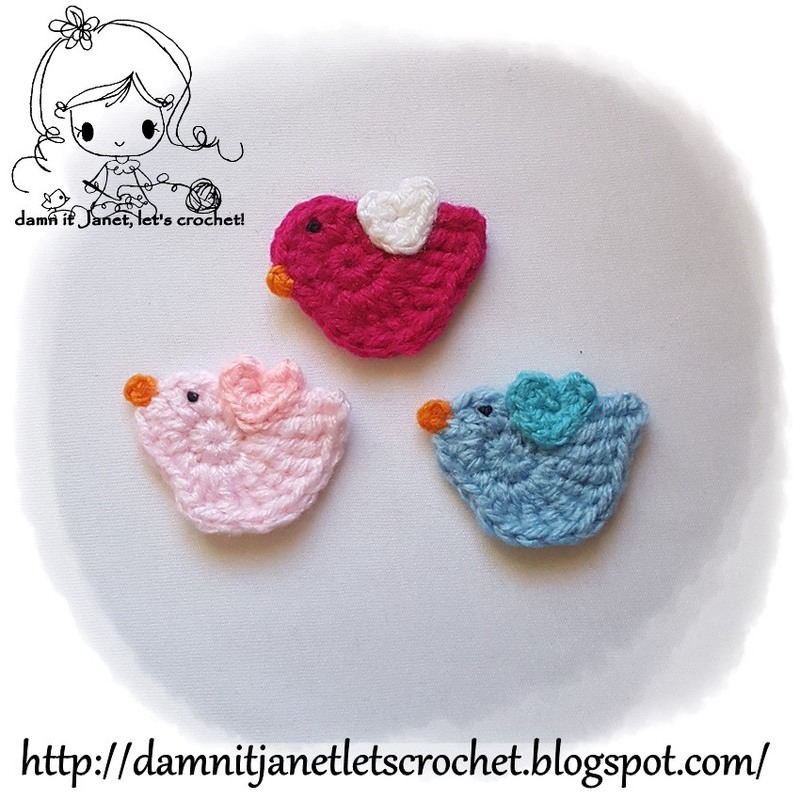 Double Treble Crochet (dtr) - Y/O hook 3 times, insert hook into stitch & pull up a loop (5 loops remaining), Y/O hook & pull thru 2 loops (4 loops remaining), Y/O hook & pull thru 2 loops (3 loops remaining), Y/O hook & pull thru 2 loops (2 loops remaining, Y/O hook & pull thru the 2 remaining loops. Triple Treble Crochet (ttr) - Y/O hook 4 times, insert hook into stitch & pull up a loop (6 loops remaining), Y/O hook & pull thru 2 loops (5 loops remaining), Y/O hook & pull thru 2 loops (4 loops remaining), Y/O hook & pull thru 2 loops (3 loops remaining), Y/O hook & pull thru 2 loops (2 loops remaining, Y/O hook & pull thru the 2 remaining loops. Rnd 1: 10sc in magic ring (10) Pull as tightly as possible so no hole is showing through. Join the orange yarn in the 7th stitch of the second row of the bird, sc in the same stitch. HEART WING...place it in the position you like best. EYE...embroider it in the position you like best. This pattern is an original pattern by Janet Carrillo "damn it Janet, let's crochet!" (January 2012). Please do not claim this pattern as your own. If you wish to share this pattern, you may link to this pattern but please do not reprint/repost it on your site. You may print and keep a copy for your own personal use. Please do not resell or distribute it.